I live in South Africa and it is a big problem getting shoes in my size. Please tell me if there is a shop here that imported from you, or is the only way for me to order myself. What if it doesn’t fit ? For the best chance of getting shoes that fit, read About Sizes: http://www.designershoes.com/about-size/size. Measure your feet carefully. If you have any questions, email info@designershoes.com before ordering. Good luck and happy shopping! I see over 2800 styles in size 10 on DesignerShoes.com today! Maybe Need Women’s Size 14? 15? 16? How Do I Know? Thanks for your previous feedback to my mail. I have taken some measurements but hey were quite discouraging in compariosn to your size chart. My length toe to heel was 32cm, and width was 11.3 cm. I saw that the size 15 was 29 cm, that means basically that there are no shoes that would fit me from your store… Ihope am wrong. Anyway back to the foot description, i have no bunions and i think my feet are soft and flabby. I love open toed shoes but we have very long winters here and i go in covered shoes almost 9 months a yr. I do not mind heels but i am 188cm tall so i really don’t need high heels. The shoes i am thinking of now are simple flat shoes for both work, casual and comfortable. I sit alot at work therefore need a flat shoe. I loved the ‘ All Black Crosstoe 11 By All Black. Would love some open toed shoes so am waiting for your advice. And by the way one of the shoes i bought that never fit was the Andiamo Island Pearlized Ivory Patent in size 13w. I actually think the shoe chart measurements at DesignerShoes.com are pretty accurate. But just because the shoe CHART measurements are correct, it doesn’t mean that the shoe MANUFACTURER measurements are correct or, for that matter, that your measurements of your feet are correct. Particularly when we venture into the women’s size 14, 15, 16 sizes, there are many fewer shoe choices and the variations in fit characteristics in these sizes can be much greater than in more commonly made sizes like 7 or 8. You need to double check your own measurements. i suggest having someone else do it for you. Make sure they hold the pencil straight up and down, and keep it pressed tight against your foot. Another tip to estimate your size, try on men’s shoes that are in US sizes. (I’ve found that Euro sizes can vary greatly depending on country of manufacture). I’m guessing a men’s size 13 or 14 might be best for you? Try on a few styles to get the best size across three or four styles. Then compare this back to the US women’s size equivalent. That said, because there are so few shoes made for women who need size 14 or more, we are all hoping that you will fit into a size 14W or 15. Not enough choices but some. There are 80 choices available today in size 15M. http://www.designershoes.com/?p=2&sizewidth=132. Brands include Barefoot Tess, Forgotten Soles, Ellie, Takera and Tamarac (the moccasin loafers are a good comfort choice for cold wearther.) The All Black Cross Strap styles are gone. But they ran very small and narrow. I think you would have been disappointed. I’m assuming you are writing from an address outside the USA and want to avoid having to send back shoes that do not fit. Please write me with your choices before placing your order. Give me more size details on your feet and the styles and sizes you want to order. I can’t promise they will fit, but I will see if I can get more information on the fit characteristics of your chosen shoes. Aussie Needs Wedding Shoes… but what US size? I’ve read your posts regarding Australia to USA conversions but I’m still really unsure as to what size shoe I should buy. The largest of my feet are 25.2cm long and 10.4 cm wide. I have to get shoes for a wedding in about 2 months and can’t find anything that fits right in the stores. Any help you could provide asap would be greatly appreciated. Thanks Tracey W.
Anything for a wedding! Are you, per chance, the bride? First the disclaimer. You Australians are far too easy going about everything…. life, shoe size and everything in between (except, perhaps, for barbecue?). You get shoes from many different countries which all have slightly or very different sizing systems. Even with in those countries (I’m tempted to mention France, but won’t) there are significantly different approaches to what constitutes a EU size 38, for example. My favorite Aussie shoe colleague, Alice, could never determine her own size. We narrowed it down to 10.5W, mainly because of the thickness of her foot… an avid sportswoman, she has very muscular feet. 9W = 25 cm long and 10.3 cm wide. 9.5W = 25.4 cm long and 10.5 cm wide. This is where picking your size becomes no longer a science but rather an art. Have a friend look at your feet objectively. Are your toes longer or shorter than average? Is your foot, like Alice’s, thicker and more muscular from top to sole than average? Do you have a high arch or no arch at all? Then compare the shape of the shoes you are considering to the shape of your foot. If you want a high heel, pointy toe closed pump, go for the 9.5W. If you want a strappy sandal and like your toes coming up close to the front edge, go for the 9W. My question is: Do you have any suggestion for shoes in size 15 which are comfortable and low heeled. I am a tall lady who has always had problems getting comfortable shoes that fit. I really need help. I have bought some shoes, 3 pairs from this website which never fit. It would cost me a lot returning them since I live in Europe and have to pay toll fees for everything I purchase outside the country. Need your advice before I start ordering for spring. I have seen some flat shoes that I liked but I cannot be sure they will be comfortable, thus need to hear you view. 1. They may take a different size in a round toed flat than a pointy toed pump. 2. They may take a different size in Brand A than in Brand B. 3. Each foot may be a different size so they need to buy the best size and shoe shape for the larger foot. 4. Some styles may be more comfortable than others. If you have flat feet or narrow heels, you may prefer a Mary Jane style. 5. The same Brand making a ballet flat can use two different factories and those factories may have different ways of cutting and shaping the shoes which mean they will fit differently. Please read http://www.designershoes.com/about-size/width for more on these differences. When you are a size 15, you have never had an opportunity to try on enough pairs of shoes in that size (or 14W or 15N) and in different styles and heel heights to know what is best for your feet. Some shoes marked size 15 are not going to work. Others are. To get the best choice for you, you need to provide the shoe seller the kind of information you would be giving someone in a shoe store. Carefully measure your feet following the instructions linked to the article above. Write back to me and let me know those measurements. But WAIT. There’s MORE! I also need to know if your arches are flat or high. Does your forefoot tend to be wider than usual? What EURO size do you wear most comfortably? Do you need a loafer, laceup or Mary Jane to keep the shoe on your foot? Do you have bunions? Is your foot thick and muscular? Soft and flabby? Skin and bones? What is the highest heel you would wear for a daily shoe? What is the lowest heel? Do you like peep toe shoes and sandals? Or do you only want closed toe shoes? Send me back that information and I’ll see what I can find to suggest. At this time I think your best bet is Barefoot Tess. But because these shoes come from different factories and are different styles, they may fit quite differently. Maybe someday you will have the choices you deserve! Q: Is it true that Australian sizes are one size smaller than u.s sizes? Therefore if I wear an 11 in aus should I order a 12 in U.S sizes? A: I have seen more U.S. sizes that when converting to Australian sizes you should buy one to one and half sizes larger, and some that have equal conversions. 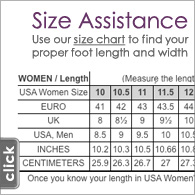 If you are browsing our website for U.S. sizes, we have a chart that list sizes in both centimeters and inches. Shoe conversion is never an exact science due to the different styles, and manufacturing procedures. Maybe one day down the road we will get more consistency. I highly recommend measuring the lengths of your feet for your target shoe size! Another new arrival. Great sensible shoe with style. Available sizes 5 – 12 and medium and wide! Q: My shoe number in EU is size 40. I have ordered size 9.5. Is that correct? A: Dear Lisbeth – With no additional information on the shape, width or girth of your feet, 9.5 would be our best guess for you. If they fit, that’s great. But whether or not they are a perfect fit, please read our articles in our website: How to Measure your Feet Correctly so you will know more about measuring your feet, assessing the shape of the shoe and getting the best fit when you shop on line.